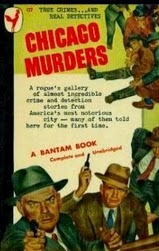 In 1945, a book entitled Chicago Murders was published, featuring several stories of Chicago killings submitted by various authors. One section, “The Case of HH Holmes” by John Bartlow Martin, was an early retelling that may have served as a model for Herbert Asbury and a Harper’s writer’s own retellings a couple of years later, which pretty well fixed the story of Holmes as we usually hear it now. It was the first account I’ve seen to mention the estimate of 200 murders (though Martin pooh-poohed it), and was the first lurid retelling of Holmes arriving in Chicago and taking over the pharmacy of Dr. Holton, presumably killing the elderly doctor and his wife (an oft-retold story that our research here proved was completely wrong). The next story in the book is “The Almost Indesctrucible Husband” by Nellise Child, the pen name of Lillian Gerard, who, two decades before, had become the most famous flapper in Chicago under the name Lillian Collier (one of our favorite topics). Here, she told the story of Mildren Bolton, who came within half an hour of being the first woman ever to be executed in Chicago. Mildred Bolton is almost completely forgotten today – I only saw one article about her online, and it was riddled with inaccuracies, right down to getting the name of her victim wrong. Hers is way too interesting a tale to have vanished so thoroughly from the record. 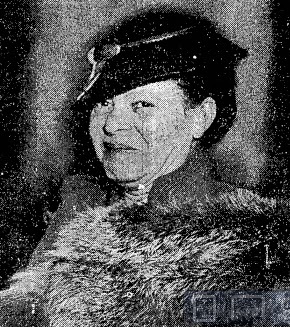 When police were called to apprehend Mildred during a fight with her estranged husband in 1936, there was nothing unusula about the call. THey’d been called about her several times. Even though she and Joseph Bolton were separated, and he was trying to obtain a divorce, she was known to become horribly jealous if she thought a woman had so much as looked at Joseph. Only days before, police had been called in when she shouted that a woman in a hotel was a whore, and her son a degenerate, because they had been up in the latest hotel where Joseph was hiding. He had been changing hotels regularly, trying to keep away from Mildred. She wasn’t entirely right. Though it was widely known that women who killed men usually got off the hook entirely in Chicago, especially if they were pretty, at least a few had been sentenced to life in prison. It was true, though, that Chicago had never executed a woman. Mildred remained flippant as the case went to trial. She joked with the press, told people that her attorney’s name was “Horsefeathers,” offered to babysit the prosecuting attorney’s children, and, though she admitted she made a mistake by not destroying her receipt for the gun, she said “I’ll get around that.” She even expected to get around the fact that Joseph had clearly not shot himself, as she said he had, seeing as how two of the bullets had entered from the back, and none had been fired at a close enough range to leave powder burns. Like many killers of both genders, Mildred received a lot of fan mail, much of it from women who said they’d have killed their own husbands years ago if they only had the nerve. Some fans came to visit her in prison, and Mildred cheerfully sent them on errands to buy her things. These, though, were all people who didn’t know her. Among those who did, not a witness could be found who could testify in her defense. 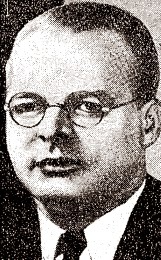 Instead, a parade of nearly four dozen witnesses came through to describe clashes they’d seen between Mildred and Joseph over the years, many of which ended with Joseph bleeding and fearing for his life. Her antics had cost him several jobs. “Marble Mildred” claimed that all of the witnesses, down to the coroner, were simply lying, but when she finally came to the stand herself, she admitted everything. She said she had gone to Joseph’s office that day to embarrass him by killing herself, but had ended up shooting him instead.